IAEA chief Yukiya Amano has said that Iran is living up to its commitments made under the 2015 international nuclear deal. The head of the International Atomic Energy Agency (IAEA) Yukiya Amano has said that Iran is living up to its commitments made under the 2015 international nuclear deal. "The agency believes that the JCPOA is an important achievement for verification. The agency could stipulate that Iran's nuclear commitments under the JCPOA are being implemented," Amano was also quoted as saying by Press TV on Sunday. 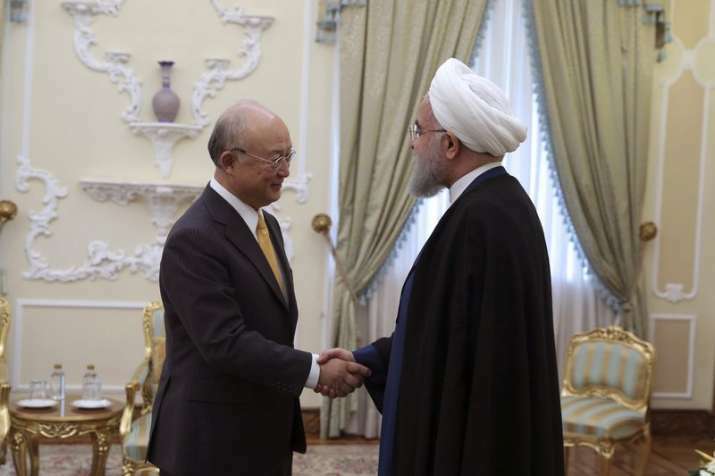 Since January 2016, the IAEA has monitored Iran's nuclear commitments under the nuclear agreement, known as the Joint Comprehensive Plan of Action (JCPOA), and conducted verification checks, said Amano. The IAEA is in charge of monitoring restrictions on Iran's nuclear program under the nuclear agreement. So far the agency has released eight reports each time confirming Iran's adherence to the international nuclear pact. The visit by Amano came as the US Congress weighs the deal. US President Donald Trump has refused to re-certify the accord made with world powers in 2015, a move that has sparked a new war of words between Iran and the United States, fueling growing mistrust and a sense of nationalism among Iranians. He urged the United Nations nuclear chief to confirm his country still adheres to the nuclear deal even as he asserted that Tehran has not stopped building missiles and has no intention of doing so. “We hope that, given the full cooperation of Iran in recent years, the IAEA announces the final report on the peaceful nature of Iran’s nuclear program as soon as possible,” Rouhani said. “We should not allow the (nuclear deal), as an important achievement, to be undermined, and we must consolidate this important international commitment with full cooperation.” he added. Speaking to parliament Sunday, Rouhani insisted that no international agreements prohibit the development of such non-nuclear weapons, and that Iran has a right to produce them for its own defence. "We will build, produce and store any weapon of any kind we need to defend ourselves, our territorial integrity and our nation, and we will not hesitate about it," he said, according to a translation provided by the Iranian Students News Agency. Several times in the speech, Rouhani took aim at the US for what he called its "shaky" commitment to the nuclear deal negotiated under the Obama administration. "The administration of a country that abandons international commitments of the previous administration is not reliable," the Iranian leader said. Iran struck the deal with world powers in 2015. It saw Iran limit its enrichment of uranium in exchange for the easing of economic sanctions. The West had put the sanctions in place over fears Iran’s nuclear program could be used to build an atomic bomb. Iran long has said its program is for peaceful purposes only. The European Union, Britain and other parties in the deal have all encouraged Trump to keep the accord in place. However, Trump punted the issue to Congress, instructing lawmakers to toughen the law that governs U.S. participation in the deal and calling on the other parties to the accord to fix a series of deficiencies. If they can’t, Trump said he will likely pull the U.S. out of the deal and reinstate previously lifted U.S. sanctions on Iran’s nuclear program, which could be a mortal blow to the agreement. On Thursday, the U.S. House of Representatives voted to put new sanctions on Iran for its pursuit of long-range ballistic missiles without derailing the deal.